Florida is the perfect place to enjoy motorcycle riding, with its long stretches of road bathed in famous Florida sunshine. But when your invigorating ride results in tragedy due to the carelessness of other motorists, securing an attorney who is familiar with motorcycle law can be an important factor in getting the justice you deserve. When cars attempt a left turn in front of you: It is not uncommon for motorists to misjudge the speed of oncoming motorcycles, or to fail to see them altogether. Statistically, 42 percent of motorcycle fatalities occur in situations such as this.As a motorcyclist, it behooves to you to anticipate driving errors in others, and slow down when approaching intersections. Recognize that whenever there is a gap in traffic, there is a possibility of a car racing through that gap. When cars change lanes right into you: Motorcycles are fairly small, and they fit comfortably into drivers’ blind spots. It is important to know where those blind spots are and avoid them. Also, be aware of any signs of an impending lane change: blinkers, drivers checking their mirrors, and wheels turning. When cars approach you from behind: What might be a minor fender-bender in a car can be fatal for a motorcyclist. Make stops on the side of lanes, not the center, and flash your brake lights to make your presence more visible. Keep an eye on the traffic approaching from behind, and be ready to skedaddle if necessary. Statistically, motorcyclists are involved in about the same number of accidents as other vehicles. But the consequences of motorcycle accidents are often much more severe. In fact, riders are 35 times more likely to die in an accident than individuals in other types of vehicles. Florida’s roads are among the deadliest in the nation for motorcyclists, with nearly 500 fatalities among motorcyclists in 2013. About 50 percent of those deaths involved riders who were riding without a helmet. 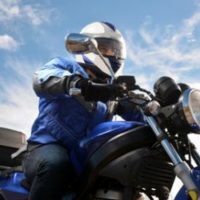 Riders over the age of 21 are not required to wear helmets as long as they carry a minimum of $10,000 of medical insurance. Riders cannot wear headphones on the road. Motorcyclists cannot overtake or pass another vehicle while remaining in the same lane as that vehicle. Motorcycles cannot be driven between lanes or rows of vehicles. Riders may not ride more than two abreast in a lane. If you or a loved one has been involved in a motorcycle accident involving another vehicle, it is likely that vehicle was at fault. The medical expenses combined with the emotional trauma associated with a motorcycle accident can be overwhelming. The aggressive, ethical motorcycle accident attorneys at the Law Offices of Robert W. Elton work to ensure motorcyclists that the negligence of other motorists will not go unnoticed. Our team has experience investigating and prosecuting these cases, and will provide the personalized attention you need. Contact us today in Daytona Beach for a no-cost, confidential consultation.